Parents have used phrases such as, “blindsided,” “devastated” and “rug pulled out from underneath me.” Some say time seems to stop. Many have reported that the line before and after is indelibly drawn in their memory. Learning your baby has Down syndrome is not an easy thing for anyone to face. When the diagnosis is presented, try to arrange for the mother and father to be together in a private setting. Encourage the parents to ask questions of appropriate medical professionals. Make sure both parents have an opportunity have their questions answered. Assure the parents nothing they did or didn’t do caused their baby to have Down syndrome. Parents may ask how you know the child has Down syndrome. You could review information the doctor has already provided or go over some of the physical characteristics of Down syndrome, such as low muscle tone or a single horizontal crease on the palm. Congratulate the parents on their baby. It is important they have a feeling of hope, and you can help them see some of the positive possibilities for their baby and for their family. 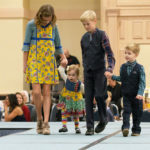 If the parents had prenatal testing, their needs may be different than those who learned of the Down syndrome diagnosis at birth. Parents should be provided with up to date printed materials. Most new parents were frustrated at either receiving outdated information or no information at all. Parents may wish to talk to other parents who have a child with Down syndrome. NADS Parent Support Program connects new parents with trained parent support volunteers. 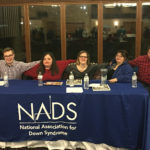 Ask if you can contact NADS on their behalf, or let parents know they can receive information and support from us by calling the NADS Family Support Coordinator at 630-325-9112. Parents will never forget their birth experience, and even though it is a challenging and difficult time, they will always remember your kindness, concern and support.